©2014 Ryan C Kunkle, licensed to About.com, Inc. There are many locations where two railroads, or two lines of the same railroad, cross each other at grade - that is, at the same level. These junctions can be interesting scenes to model, especially if there are connections between the two routes. When the crossing and connections are between different railroads, the junction is known as an interchange. These interchanges are important links in the national rail network and allow traffic to flow from one railroad to another. 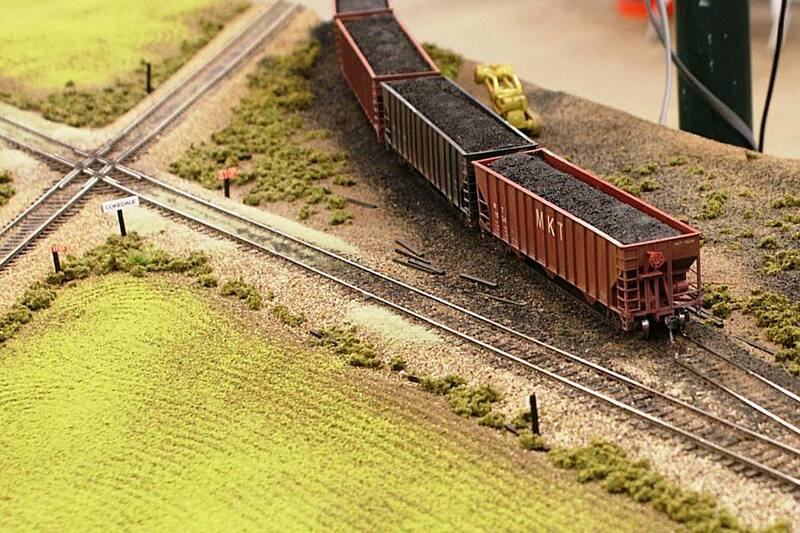 On a model railroad, an interchange is a "universal industry" that can accept any type of car. The challenge for modelers is that these junctions can often take a lot of space. Where tracks cross at or near a 90-degree angle, the footprint of a junction can occupy a substantial portion of a platform. With more and more modelers designing railroads around the walls of a room or with narrower scenes, this makes recreating a working junction difficult. You can compress a junction into a scene that will work for most model railroads. To model connecting trains from the other line, a staging yard behind a backdrop can give your trains a new place to go. The crossing itself can be modeled like the prototype, at any angle. The track can be extended to the front edge of the platform to represent that it continues beyond the layout. The other end can run to the backdrop. Adding a mirror to the backdrop is one way to convey the impression that the track continues in this direction too. You can also hide the dead-end track by putting a bridge, buildings or trees around it as it heads into the backdrop. The connecting track or tracks can also be extended toward the backdrop. Start the track with a curve that looks like it will connect with the intersecting line. Once hidden behind the backdrop, swing the interchange track parallel with your main line. Like the other line, the track can be disguised as it transitions through the backdrop by using scenery to hide the opening. If more storage is needed, a multi-track staging yard can be built here behind the backdrop. As you can see from the plans above, this simple change gives you more operation on a much thinner platform. A second "connecting" track could be added to the other side of the diamond. The two staging tracks would then cross each other on a much narrower diamond behind the backdrop. The staging tracks can be extended as far as necessary behind the backdrop. Want to add staging in the front of the layout? Using the same techniques, consider hiding the staging track behind a raised fascia or control panel. Model Railroad Track Plan - HO Scale "Lakeshore Southern"